Line 9-inch square pan with foil, extending foil over 2 opposite sides of pan. Spray foil with Crisco® Original No-Stick Cooking Spray. In medium microwavable bowl, microwave chocolate chips on High 1 to 2 minutes, stirring every 30 seconds, until melted. Stir in milk chocolate frosting and 1 teaspoon of the vanilla. 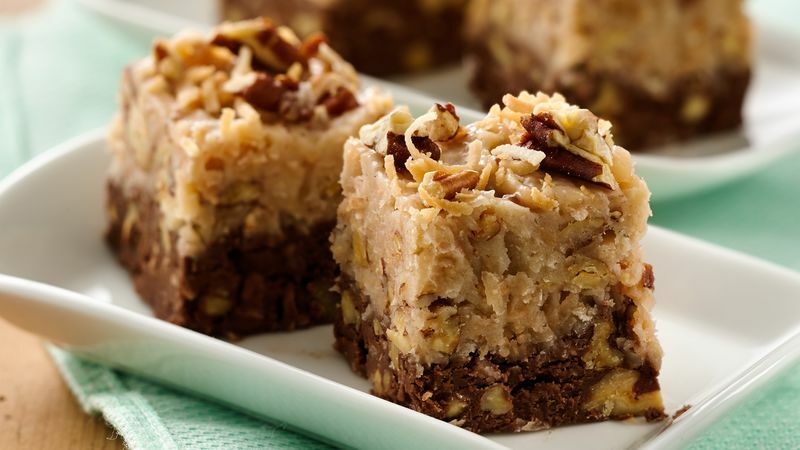 Reserve 2 tablespoons of the nuts and 2 tablespoons of the coconut. Stir half of the remaining nuts and half of the remaining coconut into the chocolate mixture. Spread in pan. In medium microwavable bowl, microwave white vanilla chips on High 1 to 2 minutes, stirring every 30 seconds, until melted. Stir in coconut pecan frosting and remaining 1 teaspoon vanilla. Stir in remaining half of the nuts and coconut. Spread over chocolate mixture. Sprinkle reserved nuts and coconut over fudge. Refrigerate 1 1/2 hours or until firm. Remove foil; cut into 8 rows by 8 rows. Store covered in refrigerator. To toast pecans, spread pecans in ungreased shallow pan. Bake at 350°F 6 to 10 minutes, stirring occasionally, until light brown. To toast coconut, spread coconut in ungreased shallow pan. Bake at 350°F 5 to 7 minutes, stirring occasionally, until golden brown.